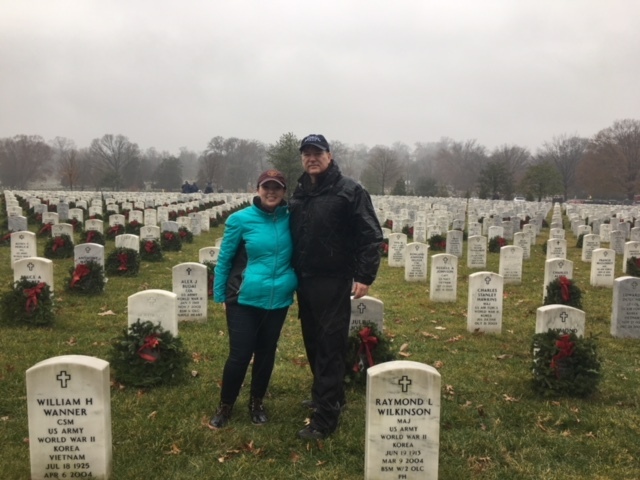 June Elliot's son Chuck and her granddaughter Reagan helped with Wreaths Across American at Arlington Cemetery in Virginia. After nearly 50 years the Class has approved a new governing document to replace the one which was approved at our 50th Reunion. It reflects the fact that we have lost more than 500 of our classmates and our Class activities are greatly reduced. It provides for the governance until such time as the remaining Class members elect to dissolve the document. A new Executive Board is being formed, replacing the Board of Governors that has done the Class business for the past 50 years. The new Articles of Governance can be downloaded here or viewed below. The members of the Class of 1950 will be asked to vote on a proposal to "retire" the present Constitution and By-laws and replace them with the BOG approved "Articles for Governance --". The Articles of Governance can be downloaded here or viewed below. Karin and I recently returned from Russia on a Viking river boat, beginning in St Petersburg, ending in Moscow. Worth doing before we get too old! Having been to both major cities some years back, we were struck by the greatly increased number of cars on the city streets and by the cleanliness of the cities. Difficult to tell if the people are happy or sad, or just placid, but the impact of sanctions is not readily apparent. The Hermitage is as splendid as ever as is the Kremlin with a great deal of construction activity everywhere. We weren't bothered by any "politicking" anywhere. Viking takes great care of its passengers. All in all, a very enjoyable trip. Big Bill Kellum led a platoon in the 21st Regiment of the 24th Infantry Division, earning the Silver Star. After his capture, Kellum organized resistance to Chinese indoctrination at Camp Five – Ponktong near the Chinese/North Korean border. His punishment was confinement to a special section of the camp hospital (no prisoner left alive), where he died in June 1951. Grads would walk next to the wire whistling “On Brave Old Army Team” to encourage Bill. Po and Patty Cornay are still going strong in Bellevue, WA, enjoying the weather in that part of the country. Bill heard that we are just past the half way mark for the $10K to fund the Class Bench at the new Army National Museum. To make a donation over the phone, our contact Katie can be reached at 703-562-4174. The bench will be seen by great crowds when it opens and we will be right there to tell the world of the Class of 1950. Bill is working with the US Army National Museum to have a permanent memorial to the Class at the Museum in the form of a bench outside of the Museum buildings. Our goal is to raise $10,000. They have set up an account for the Class in their database so that they can keep track of the donations that come in, much the same as we did for the Korean Memorial in San Francisco. That way the donations would be tax deductible. If anyone would like to make a donation over the phone, our contact Katie can be reached at 703-562-4174. I hope you will support the effort as you did the Korean Memorial, as another chance to memorialize the Class of 1950. With Memorial Day coming up this would be a fine way to remember. "Frank and I were invited to a MONTANA AVIATION CONFERENCE to tell our Air Force and NASA space personal stories to aviation buffs - ex-military and private flyers. The excellent moderator was a retired Air Force fighter pilot, USAFA 1979. Lots of history and laughs." Instead of the 90 minutes this program lasted, they would have listened all afternoon. Everyone hoped they would have just a little of the clarity of mind these two gents do. All hoped for a friendship like Charles and Frank have had…70+ years. What an opportunity the nearly 300 people who packed the room to standing room only had. Frank Borman and Charlie Kuyk with Pete Bunce.